Like a perfect sandcastle, the golden fort of Jaisalmer rises out of the desert. Setting eyes on this architectural wonder for the first time is surreal, it’s hard to believe this tiny town is only a few kilometres from the Pakistan border. But long before Jaisalmer became a strategic base for India, it was a spiritual kingdom that was first envisaged by Lord Krishna. It became a wealthy city thanks to its strategic position on the trading route between Delhi and the east, and many in turn settled here, creating some of the beautiful architectural sites that still adorn the town. 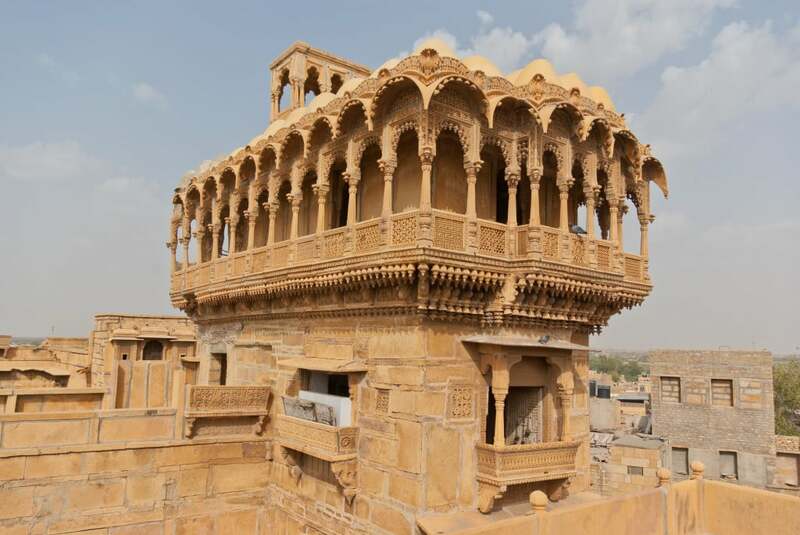 It’s impossible to visit Jaisalmer without being spellbound by its golden fort. Made of sandstone and surrounded by the desert, this living fort is still a bustle of activity. It’s easy to wander the narrow laneways for hours, chatting to traders, sampling their wares and being captivated by the viewpoints along the way. The fort is also home to palaces and temples that hint of the glory of years gone by. The Raj Mahal Palace was built in the 16th century and is adorned with delicate Jali screens that let glimpses of light into its inner walls. Now a museum and heritage centre, it houses some interesting artefacts and paintings from the Maharajas. And at the top of the palace you can get one of the best views across the town. The fort also houses some of India’s finest Jain Temples, seven altogether. These are interconnected, but only open for a short time each day, so be sure to check timings so you don’t miss out. Some temples date back to the 12th century and their grandeur reflect the wealth of the Jain community. Marble carvings can be found throughout the temples, some even depict Hindu gods, demonstrating the harmony between the cultures. The Laxminath Temple is a dedicated to the Hindu Goddess of Wealth, who was also Lord Vishnu’s wife. 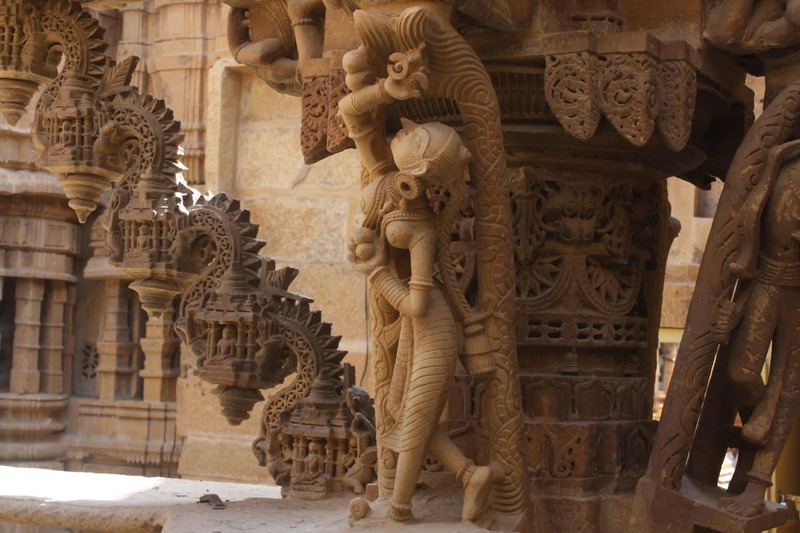 While the temple is not as grand as the Jain Temples, it makes for an interesting comparison. Many of the rich traders and dignitaries who settled in Jaislamer built spectacular houses called Havelis. Some of these are even open to the public today, the most famous being the Patwon ki Haveli which is outside the fort. Built in the 19th century by a Jain trader it’s actually five houses, elaborately decorated with intricate stone lattice and murals. Another haveli worth visiting is Salim Singh Ki Haveli which has a roof lined with peacocks that complement the yellowstone facade and balconies. If you prefer elephants, then visit the Nathmal ki Haveli where two huge carvings of the beast will greet you. The Thar Desert surrounds Jaisalmer, making this a popular launching pad for a desert adventure. There are many ways to see the sand dunes, depending on your comfort level you can camp out in the stars, or just make a quick dash to the dunes for a couple of hours. The camel ride is almost mandatory, and can make for an interesting way to see the desert like the explorers and traders once did. While Jaisalmer is a small town, there’s actually plenty of charm and interesting things to see and do to keep you fascinated for a few days. There’s no need to rush here, just sit back and enjoy the serenity and the stars in the desert.